Pursuing quality hawking is ever challenging in the modern-day world and further complicated when trying to balance conflicting work-family-life demands. 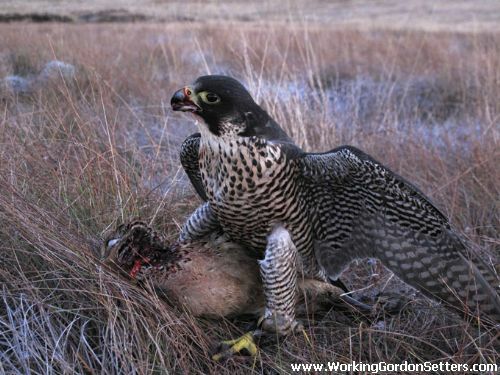 As a result falconry, and especially game hawking, is not for the faint hearted. That said, falconry continues to be practiced to high standard in the UK and by increasing numbers. And this just goes to show how successful falconers are in finding innovative ways to get afield in order to feed their passion of this ancient field sport. While I believe that winter hawking early in the morning is nothing new, it constantly surprises me when questioned about why I have adopted this practice. It all began over four decades ago, as a school boy, where I applied this early morning routine during the winter months in exercising my hawk before running off to school in time for class. These were relatively simple times, as I only ever had one bird at any given time and my routine was non-complex in either hunting sparrows round the grain barns of the local farm with a musket or trying to perfect my lure swinging skills with a kestrel in a nearby field. Even so I always seemed to get lucky (and by that I mean I never lost a hawk in those non-telemetry days) and so I always returned home in time to undertake that dash to school. On my return from university it was not long before I started to fly large longwings at game. While achieving success and realising a good standard (in my humble opinion) with tiercel peregrines (notably a 1987 eyas called Troy), it was not until I tried a female peregrine (a 1990 eyas called Morticia) that I realised game hawking with a falcon was a completely different ball-game and that to attain comparable tiercel-like pitches and style would require different field practices. While Morticia never made the grade, the gamehawking with a falcon “thing” consumed me as resulting in only the occasional tiercel appearing on the cadge since those times. The timing of that realisation coincided with the publication of two modern day falconry classics (“Gamehawking” by Ray Turner and “Gamehawking At It’s Very Best” by Hal Webster & James Enderson). While Turner’s book drove home the need for an (and already acknowledged) highly disciplined, analytical and continuous improvement approach, it was specifically a chapter in the later book by Mike Connolly that reminded me of the early morning hawking I practiced as a school boy. Connolly’s duck hawking article revealed that he was rising early at weekends to travel considerable distances to reach quality hawking locations before first light. And it was the travel aspect that I found intriguing as it appeared Connolly was purposefully rising early in order to feed his passion and yet not allowing his sport to significantly interfere or disrupt his daily domestic and business commitments. Furthermore Connolly’s article clearly portrayed he was more than succeeding in achieving an extremely high standard of duck hawking, notably with a large Aleutian peales falcon called “Witch”. At that time the game numbers in my region were healthy and so finding sufficient quality lowland slips was not the issue in the earlier part of the season. However finding quality, uncompromised slips was a lot more challenging in the November to January time-window, given the extent of ploughing activity. So the big questions was - would the Connolly early morning routine improve my work-family-life balance and yield improvement on my present-day field standards? And furthermore, would adoption of the approach allow me to travel further afield and perhaps realise a falconry goal of flying red grouse on a regular basis through-out the season? While I adopted with some reservations, I quickly concluded that this was the only way to go and especially during the later winter months of the game season. Given decreasing game numbers over the past decades the Connolly Method has paid dividends, as my experiences now match those he experienced in a late 80’s, over-crowded California. And that is the falconer needs to continually seek out and travel to quality locations to achieve and maintain high quality hawking. And early morning hawking allows that to happen. In line with the above (and having used the Connolly Method for well over two decades) I hereby outline the approach and practices that I have adopted to realise associated benefits and to make this a win-win situation in terms of modern winter gamehawking. Eyasses are generally collected in mid to late July. Given that I field trial my Irish setters on the Pointer & Setter summer circuit during July & August, all eyasses are subjected to extensive manning and basic lure work and believe these to be cornerstones and hidden gems of excellent falconry. My method here is to simply man the eyas with absolutely no use of the scales or weight reduction controls while on the road. Here I simply allow the eyasses to find their own weight and so allow them to eat as much as they desire at a single feeding session. By adopting I allow the manning, carriage and daily field trial “life on the road” routines to do the rest. As a result I find I exit the summer field trial circuit with a rock-steady falcon, reflecting a higher weight (than otherwise might have been possible if dieting, darkened mews and use of the hood practices were the only control methods applied) and more than ready to fly free. A recent example of this would be a small eyas falcon I obtained from Scott Levitt in 2011. This falcon exited the aviary in late July at 1lb 14.5oz; exited the summer field trial circuit in mid August to fly free the next day at 1lb 12.5oz and ended her first flying season in early January flying at 1lb 14oz. Thereafter the eyasses are kited to great heights in the late evening hours of late August and the first half of September, before being introduced to game scenarios. Intermewed falcons on the other hand are removed from breeding-moulting chambers in mid August and weight controlled to allow them to be kited during first half of September before moving onto game hawking refresher scenarios. Undertaking the above is not the fast lane (and so some may challenge the approach), but this is the routine that allows me to balance my work-family-life demands and to iron out performance wrinkles before I go hunting (essential with intermewed peregrine falcons in my opinion). Furthermore I dislike hunting early season game from an ethical perspective. The end of October signals the onset of winter and the associated clock change (from BST to GMT time) brings about the un-welcomed reduction in daylight hours at the back end of the day. To avoid this interfering with my falconry I transition the falcons (upon clock change) over to morning feeds. The feeding routine transition is easy to do and below is the process I’ve adopted for many years. You shall note that I morning feed the falcons for a few days before venturing afield. It may be unnecessary, but this practice allows me to observe behaviours (especially with eyasses) before undertaking a morning flight later that first week. In effect this is a peace of mind process. The first few morning flights for me are always nervy affairs with eyasses. Those feelings are no different to when the creance is removed for an eyas’ first free flight in late summer. However providing weight control practices have been followed these morning flights go without mishap. That said I initially do not fly eyasses until the sun has crested the horizon. This sun-rise aspect remains for a few weeks to allow the eyasses to settle into the morning routine. Thereafter I fly so long as can distinguish game or a pointing dog in the gloomy light of early morning. Falconers often ask me why I elect to fly so early? Quite simply this is because of my busy timetable and trying to fit everything in. Dog handlers also ask the same question as early morning is generally not conducive to good scenting conditions. My response here is that while a dog shall fluff a point or two, I don’t get disappointed as I know they shall learn from these experiences and be better off for it in the long term. Another question presented is, shall flying early and in poor light conditions affect a falcons’ pitch? Here people believe the falcons’ vision shall be impaired due to the early morning light conditions. Believe me, the falcons’ eyesight is the last thing the falconer needs to concern him/herself about. Mid winter is a time when only the strongest quarry is present. It is also a time of challenging weather conditions, as well as diminishing availability of lowland arable ground given ploughing activity. This can result in lowland quarry being hard to find and even harder to find in the right locations. Obtaining suitable ground is always a challenge, so I try to optimise what I already have and do so by strategically locating game bird feeders, thereby providing food for wild as well as released game birds. Even going to such lengths shall not provide you with the ideal slip every time, but it helps in keeping gamebirds on your ground and does increase opportunity when afield. Some people struggle to believe the result of doing something so simple can yield so much payback. However this is no different to having a bird feeder in your back garden, and anyone who does shall testify how often that feeder needs replenishing during the winter months. Additionally it is good practice to reduce the number of visits made to any particular hawking location. While common sense, ground rotation is important to avoid over disturbance. Upon returning home after flying I like (if the weather is suitable) to offer the falcons a bath as I believe bathing is important from a husbandry perspective, as well as from a falcon health perspective. This practice gives me comfort the falcon has cleaned herself, her equipment has been cleansed; all allowing the falcon to idle away the afternoon drying off and readying her feathers for the next assault on the sky. Baths are offered regardless of temperature and it may surprise some that falcons will bathe even in double digit minus temperatures. There is obviously some management required in these situations to avoid feather freezing, but that effort is minimal. Falconry is enjoyed by many, though it still surprises me how few falconers use dogs. I grew up reading falconry literature by Ap Evans, Blaine, Upton, Woodford, et al. They were my inspiration and each was very successful in the field and I believe it was no coincidence they all used top pedigreed setters, pointers and spaniels. As such it was a no brainer for me to follow suit, though I elected to do it the difficult way by initially using HPRs. These days many falconers rely on high powered optics for spotting game as well as using a friend to walk them into a set-up. While I use optics when on lowland ground, I simply replace the friend element with man’s best friend - the dog. And it is my belief that a dog is more reliable as they don’t chat, slow down when walking into a set-up or take their eye off the game to glance upwards to watch the falcon. A dog simply works a pattern, hits scent and has only one thing in mind and that is the game in front. As a result I use dogs no matter what the situation; be that wetland, lowland, upland or high upland. And where-ever I doubt a dog’s sense and take control; the flight fails to meet expectations. Given this dependency I spend a lot of time outwith the falconry calendar running my dogs and competing at pointer and setter field trials. In all my desire is to improve my dog handler skills to allow fine tuning of the dog’s abilities so that my falcons may benefit from our collective experiences. I am not alone in the falconry community to believe the dog aspect is another cornerstone of excellent falconry. As such I am joined at the pointer and setter field trials by fellow falconers Daryl Edwards (Stanedge English Setters) and Lee Cooper (Godrib Pointers) and most recently by Steve Roberts. While falconry in general is a time-consuming field sport, effective time-management can provide the falconer with opportunities to extend the flying season, improve upon previous seasons’ standard and yet still achieve a work-family-life balance. - Starting early allows the falconer to feed the passion before breakfast - what a way to start the day! The Connolly approach has served me well and in my opinion flying at first light (during the winter months) has many benefits and few dis-advantages. As such I believe it is never too early to fly…..